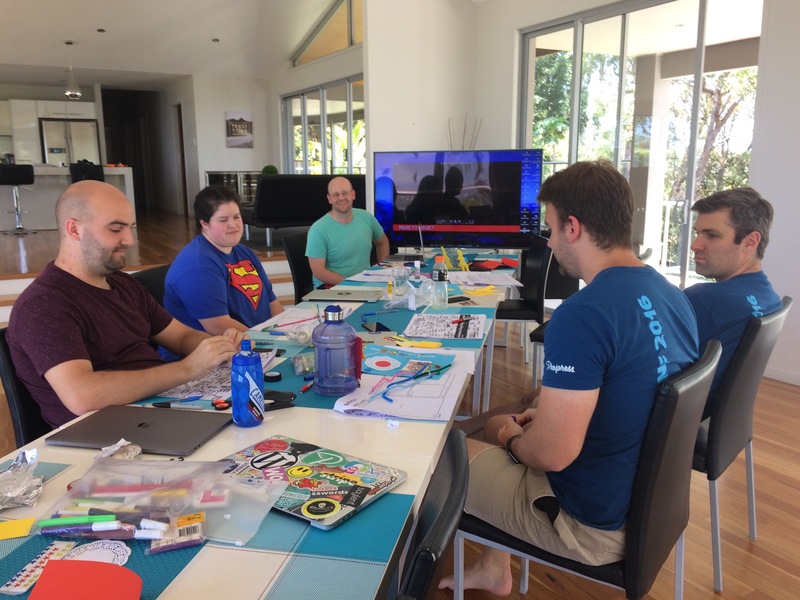 A couple of weeks ago, our whole team congregated in Australia for the fourth Prospress meetup. 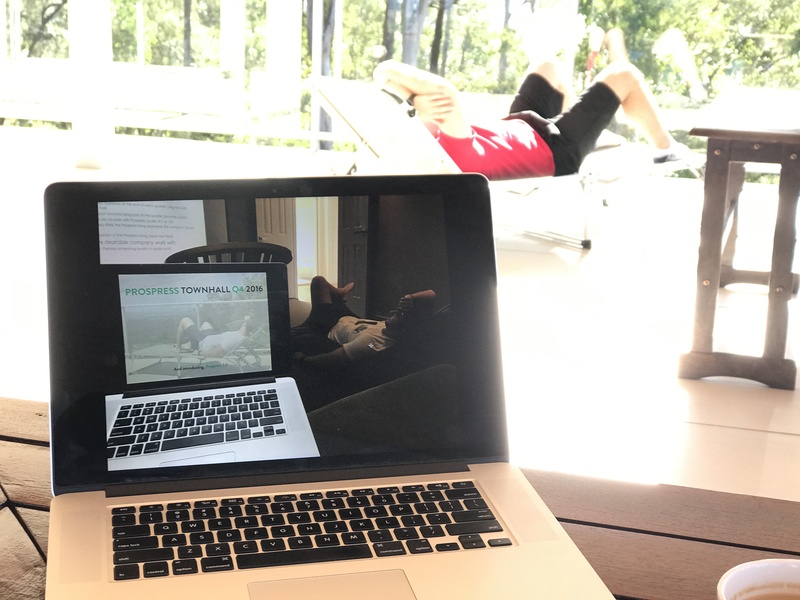 After Austintatious back in April we decided to do things a little differently and try decoupling our company meetup from any major conferences as they often leave us jet lagged, exhausted, and all “peopled out”. It’s not a good look for a bunch of introverts. Although, having said that, the people who had to travel the furthest (the three of us based in North America) went to Philly for Post Status and WordCamp US the week before flying to Australia. 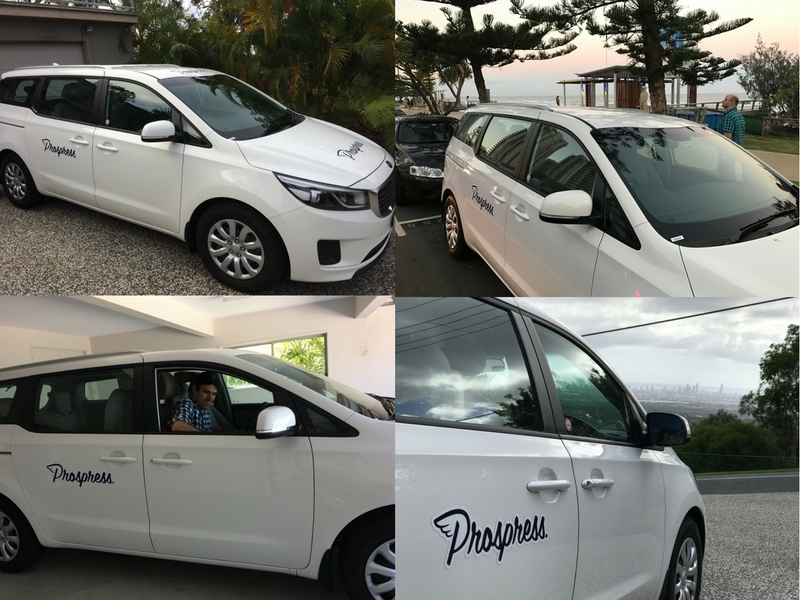 On a humid Sunday afternoon we all met at Brisbane airport to collect the Prospress family wagon that would serve as our chariot for the coming week. The first team building challenge was to tetris all the bags into the back of the van. This is where the wagon earned the nickname “old Big Belly”, because she rolls real deep. 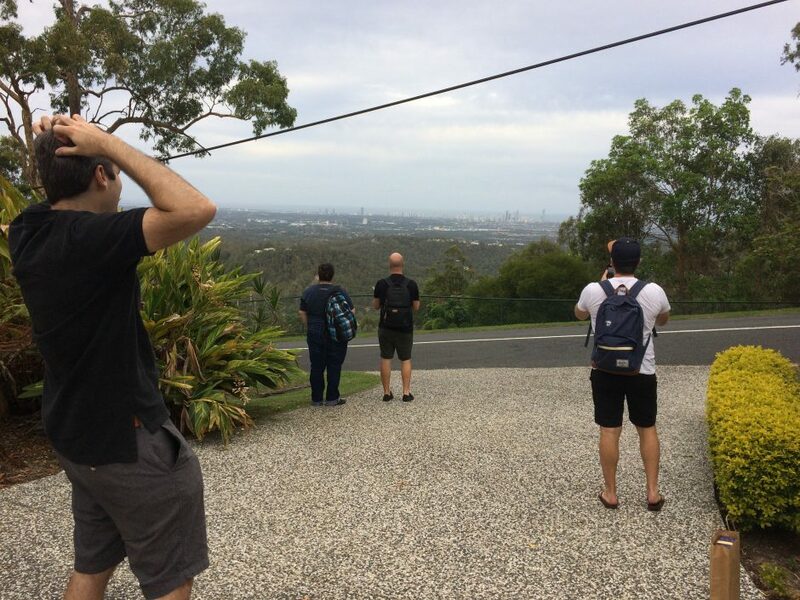 With a delirious and jetlagged Brent navigating and a far more coherent Jason steering the ship, we turned off the highway and headed into the hills behind the Gold Coast. Old Big Belly almost met her match going up the steep 20% incline to our temporary home, but she made it despite a full load of people and luggage. 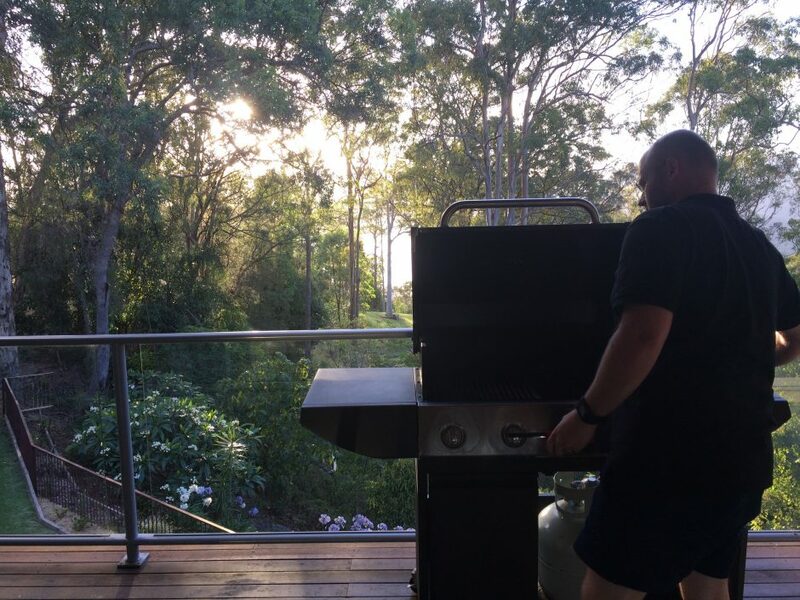 Our home for the week was a huge 6 bedroom house with views over the Hinze Dam on one side and views to the Gold Coast and the ocean on the other side. The entire house seemed to be designed to justify the enormous deck. The first order of business was to find a Sunday night dinner of fish and chips on the beach, but not before old Big Belly was properly branded! Lauren discovered how warm the Pacific is on this side of the earth, and how noisy the rainbow lorikeets are at sunset. 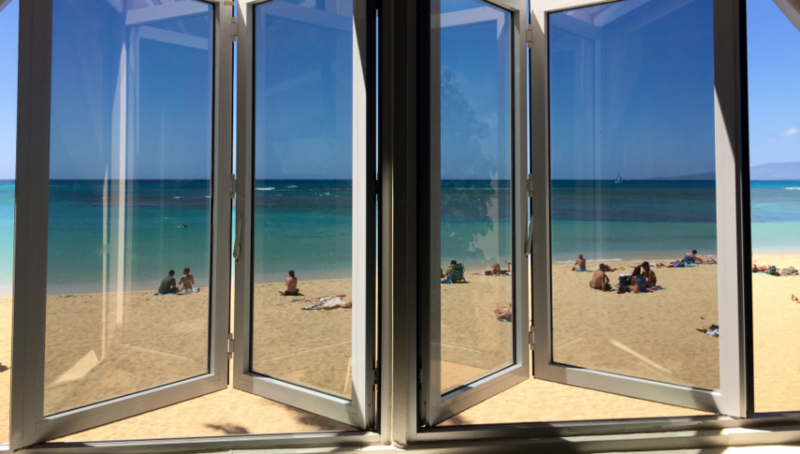 On Monday morning we were up bright and early for a trip to the beach (with our brand new Prospress beach towels), and the best coffee we’ve had in a very long while. Not a bad way to start off the meetup. Back at the house, we discovered that the internet couldn’t cope with our demands so Brent set up his modem and we all connected to A LAN Downunder (possibly the best name for a wifi network). Then it was time for the real work of the day: team presentations about our projects since the last Prospress meetup and what’s coming in the next 6 months. First was my PowerPoint presentation called “Gettin bloggy with it” about the Prospress blogs and their future. Next Lauren and James told us all about “Subscriptions 2.2 and Beyond” (so much cool stuff to come!) Then we heard from Jason and Matt who took us through “Prospress Next – Building a Robot Ninja”. Finally, the IRL Town Hall with Brent capped off our day with an inspirational call to action on our 3 year goals. 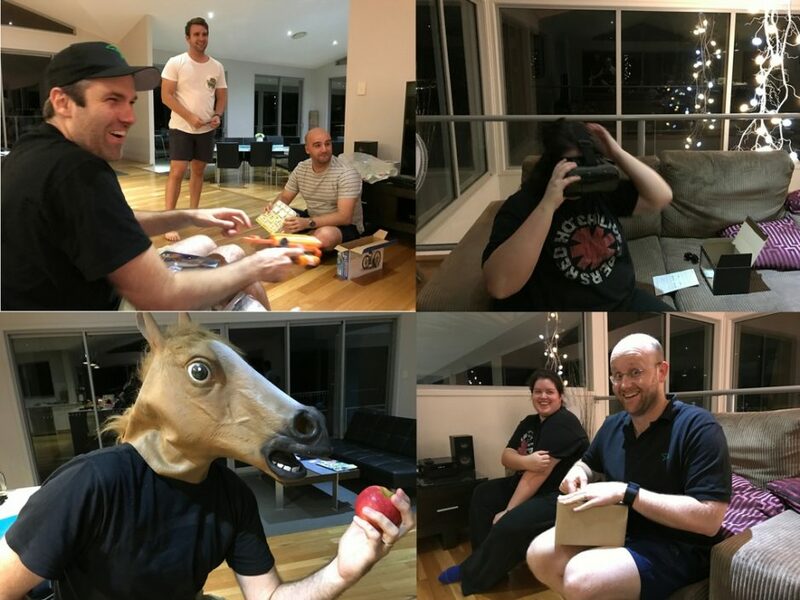 Our “White Elephant” after dinner produced some extremely stiff competition for the VR headset and the rubber horse’s head, and resulted in a lot of laughs. In the end everyone had something fun, with Nerf guns, robot kits, and castanets rounding out the pile of booty. Tuesday started with cold sausages, a meal that Matt swears by. I don’t know if we were all convinced but we certainly gave it a shot. After that breakfast of champions, we headed to the Rainforest Sky Walk. 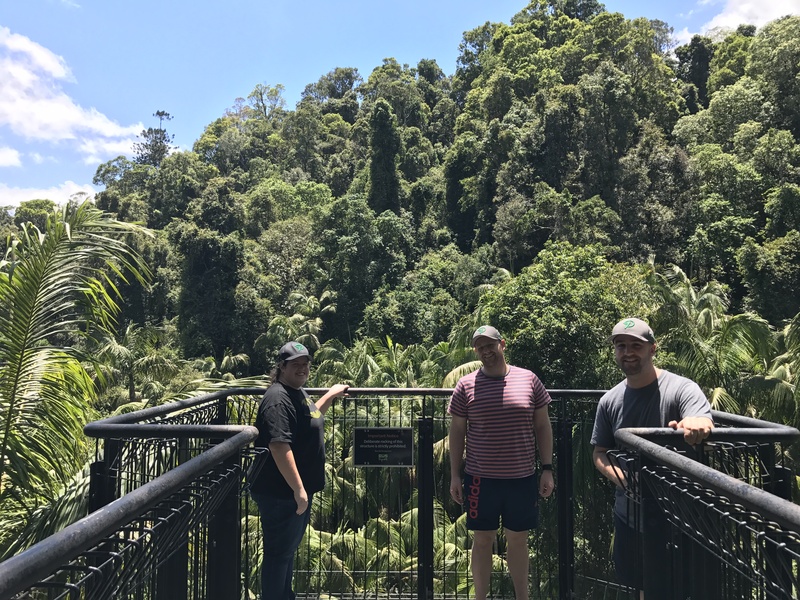 We took laps around the boardwalk through the canopy of the rainforest while doing our round robin one-on-ones. These are usually a favourite part of the meetup and we loved having our chats while in such beautiful surroundings. We headed back to the house for lunch, but our next task was to teach Lauren the mystical art of Tim Tams and tea in an afternoon tea ceremony. Brent took it up a level by doubling up on biscuits – he downed both a regular Tim Tam and a caramel Tim Tam at the same time! Unfortunately Brent had been out of the country for a while, and found his tolerance had dropped and that level of intensity was a bit much. 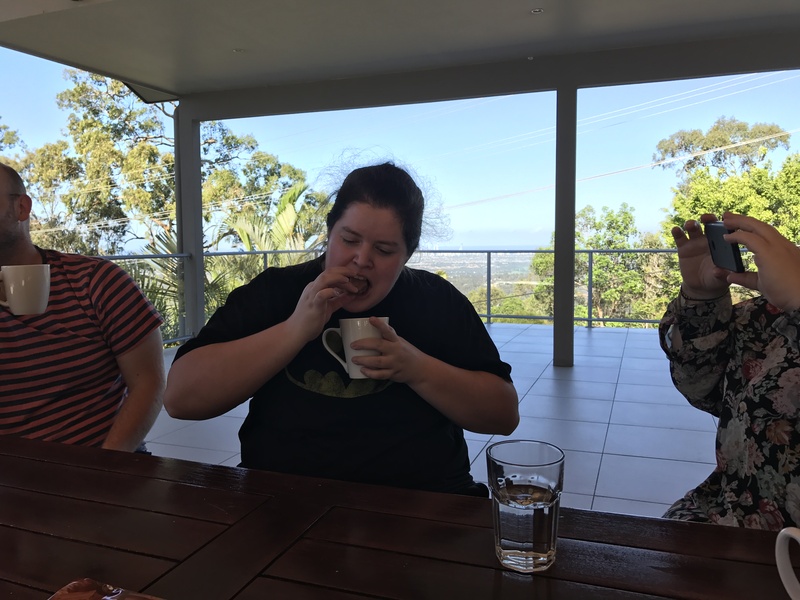 The rest of us stuck to one bikkie at a time and Lauren now knows the proper way to eat a Tim Tam. High on sugar and tea, we were ready for the next organised session. Self promotion is something that a lot of introverts can struggle with, so we spent an excruciating couple of hours interviewing each other and trying to write new bios for the website. After surviving that pain, we headed back down the epic hill for our evening activity: The Escape Game Gold Coast. It was the first time most of us had done something like this, but luckily Brent had made a few escapes before. Everything was going along well until we were stuck on a particular puzzle, but Lauren quietly went all Good Will Hunting in the corner and solved the clue, unlocking the next room. Thanks to that breakthrough, we were able to continue, solving the mystery and escaping the room! Wednesday morning saw the crew in the fresh air out on that enormous verandah taking care of support issues before we started official meetup business. Our first scheduled activity for Wednesday was to work through the Design School gift giving experience. We broke into pairs and went through the design process to develop a product for our partner by using design thinking process. We then did some rapid prototyping using random craft items, which resulted in some hilarious objects. Brent’s was a Facebook app which could determine the best gift to give someone based on their Facebook data. Kind of like a reverse wishlist, where instead of someone adding things to a wishlist that you can see, you could ask the app what someone you know would want and it would figure it out. Lauren produced a prototype of a drone powered flying delivery system that was supposed to be both fun and useful, while mine was a device designed to read minds. Dinner on Wednesday was a typical local staple – Thai takeaway – which is pretty much the national food of Australia. On Thursday morning we worked with a facilitator from Corporate Challenge. 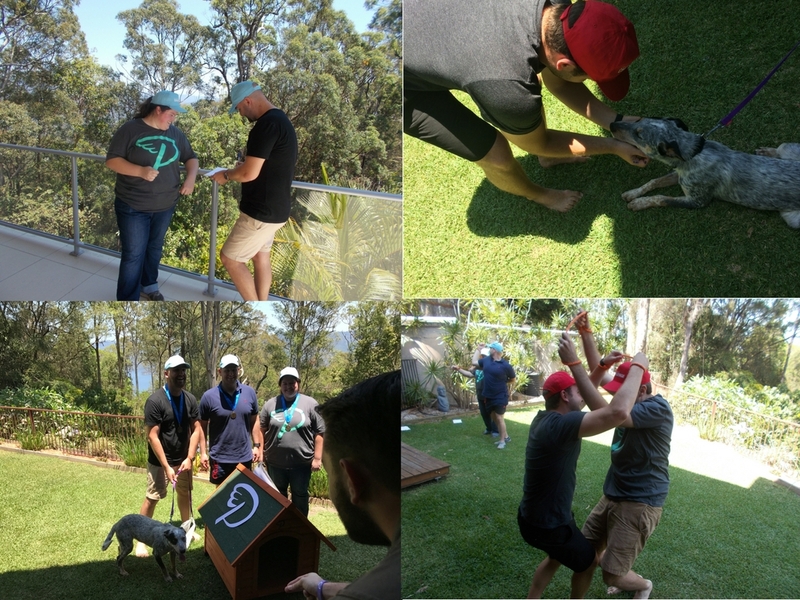 After a range of team building activities, we built two dog houses for the local animal shelter (both of which ended up with the Prospress logo above the doorway!). Team B (Lauren, James, and Jason) won the challenge part of the activities and were rewarded with a medal and bragging rights until the next meetup. But the real treat was the opportunity to meet one of the rescue pups, a little beauty called Jasper who promptly stole our hearts. I am still surprised one of us didn’t adopt him on the spot. Thursday afternoon we did some coworking, keeping up with support and our other duties. 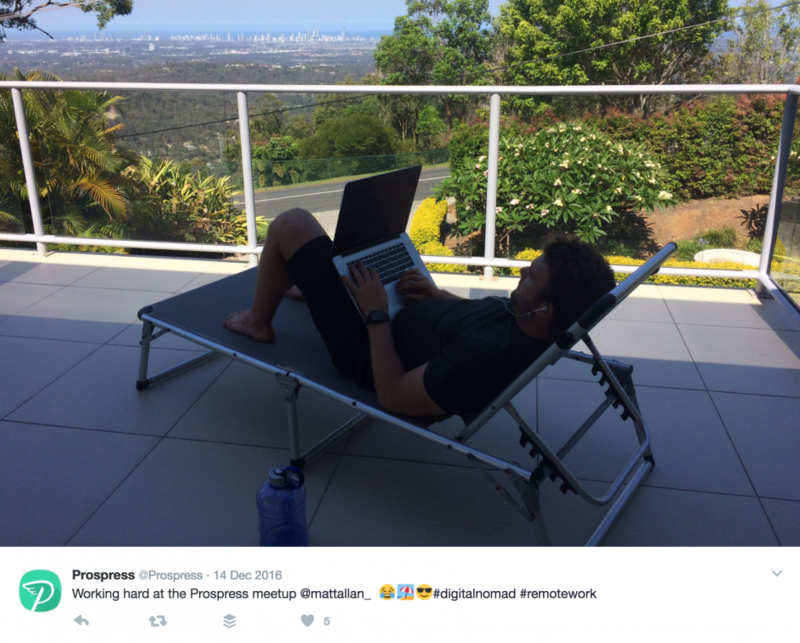 Matt took full advantage of the sun lounges, the view, and the verandah, showing us how remote work is done. Later in the afternoon, we checked out the Hinze Dam which was a lovely spot for sightseeing, walking, and coffee. On Thursday night we made our way through some very random leftovers (baked beans and Thai food anyone?) before succumbing to the lure of an evening trip to MacDonald’s. We knew Lauren was becoming fluent in Australian (Strine) when she understood Matt’s declaration “I’m so keen for a Maccas run”. 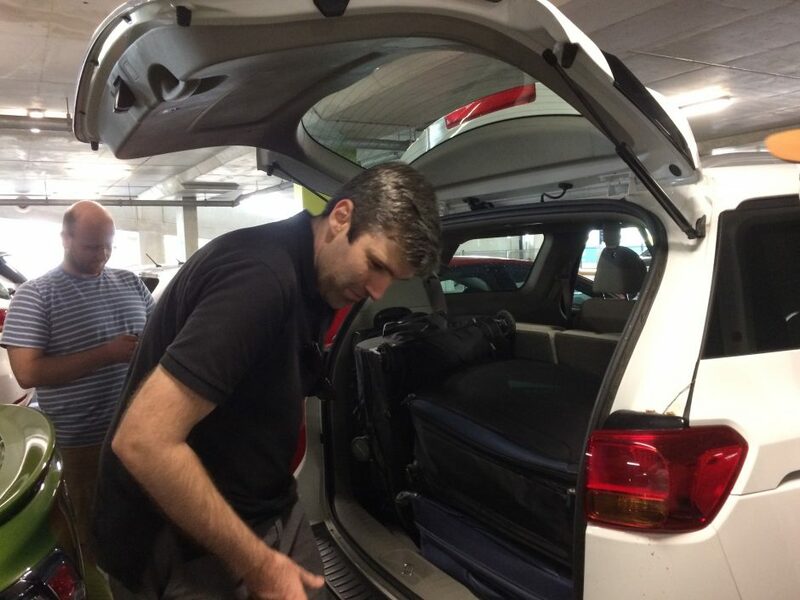 Friday morning we packed up old Big Belly and headed back to Brisbane, where we did some coworking in the famous Three Monkeys cafe in West End. 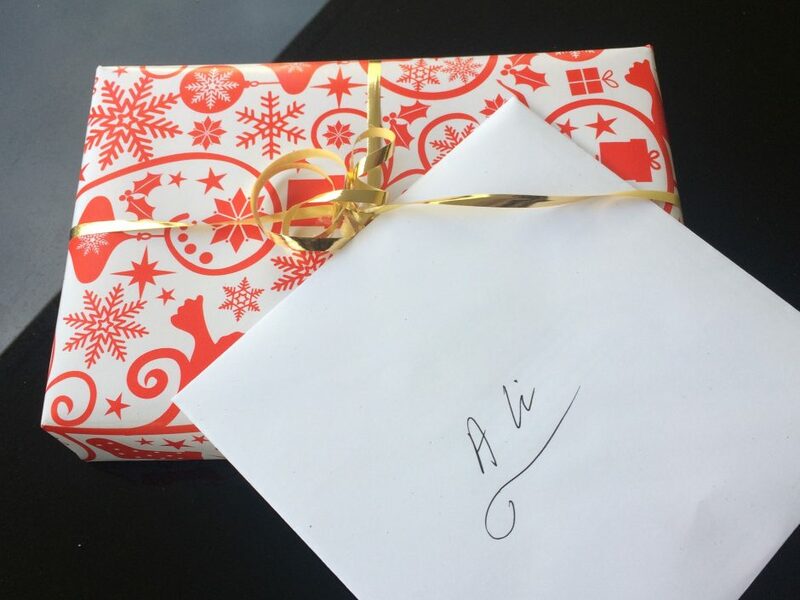 Then we checked into our apartments in downtown Brisbane, where Brent played Santa by handing out our Christmas presents from Prospress (iPads!). Fired up with holiday cheer, we took an Uber over to Southbank for our Christmas party with the Human Made chaps. 😀 We always love seeing Bronson Quick, Ryan McCue, Lachie MacPherson and it was fun to see Dion Hulse on a different continent (we’d seen him in Philly for WordCamp US the week before). Lots of good food and Christmas bonbons and some outrageous cocktails warmed us up for our karaoke session, where Brent serenaded Matt and James with “You are so Beautiful”, and Lauren busted out a perfect rendition of “Fancy”, shocking us all! But the icing on the karaoke cake was the group rendition of “Land Down Under”. We’d heard that Bronson was suggesting a camel-case spelling of Prospress (it’s a lower-case P dangit), so Brent made a special adaptation of the Human Made logo. 😉 It was a great night and even ended at a respectable hour (around midnight). The next morning we were up bright and early again, and after a quick Saturday morning brunch (with excellent coffee) we all went our separate ways. 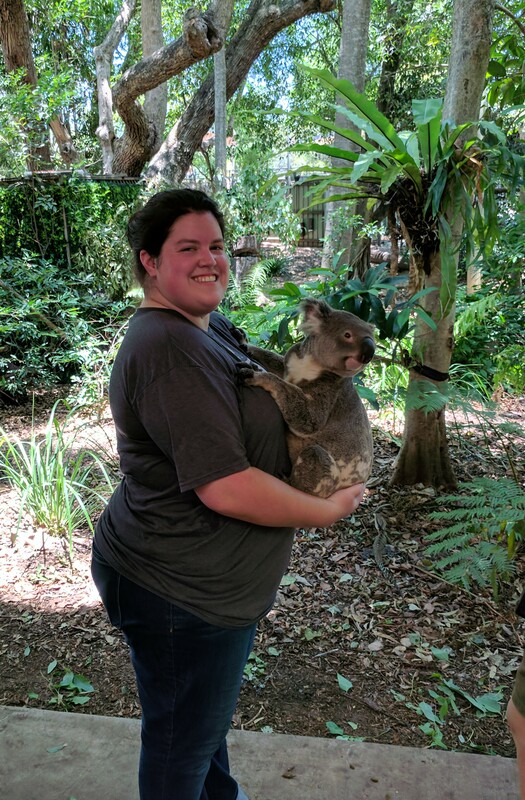 Lauren headed off for a tour of Lone Pine where she made friends with one of the locals. There may or may not now be a koala living in Lauren’s closet in California. 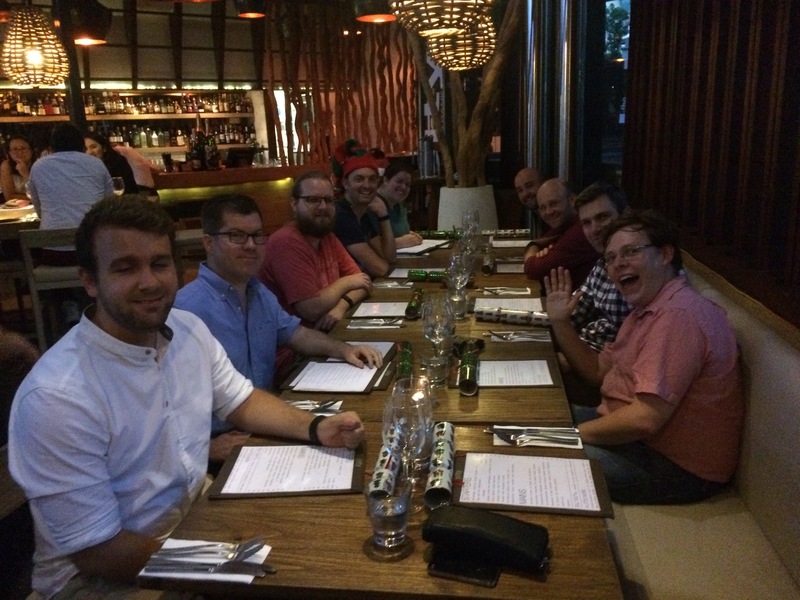 Our first Prospress meetup was relaxed (Campstravaganza 2014, in San Francisco). The second was intense (Fiesta Espana 2015, in Seville), and for the third (Austintatous 2016, in Austin Texas) we tried to be a bit of both. This meetup was mostly chill, with a couple of organised activities focused on team building and getting to know each other socially. Some team members definitely embraced chill mode whole-heartedly (this seemed to be Matt’s default pose). One of our proudest achievements of the week was that we managed to expand the number of items we’ve put the Prospress brand on – we branded beach towels, ol’ Big Belly the van, and two doghouses. 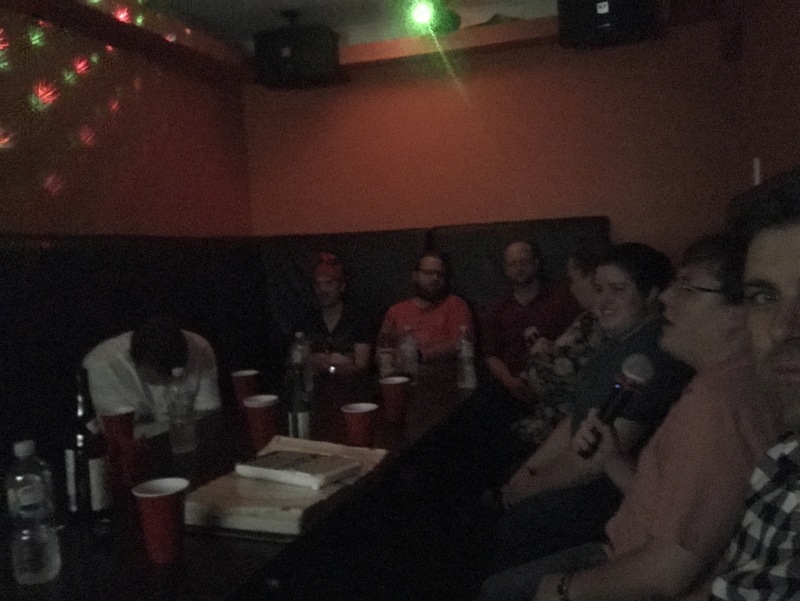 But seriously, the best part of the meetup was the IRL time with the whole team, getting to know each other in 3D, and sharing the lolz face to face. We’re already looking forward to the next Prospress meetup, which is shaping up to be in Paris for WordCamp Europe. If you’re interested in being part of that magic, keep an eye on our job postings, we’d love to hear from you!